The University’s mission is to offer students an array of business, liberal arts and sciences, and pre-professional programs of study that create a life transforming educational opportunity which is practical in its application, global in its scope, and multi-disciplinary in its general education core. Students will acquire depth of knowledge and expertise in their chosen field of study, balanced by breadth of knowledge across various disciplines. Special emphasis is placed on enhancing oral and written communication, and critical thinking skills. The Ride Like a Knight "RLAK" program enables St. Andrews University students to actively participate in a working therapeutic horsemanship program while at the same time bring the benefits of horseback riding to persons with disabilities in the surrounding community. St Andrews University is a branch of Webber International University. St Andrews University’s (SAU) "Ride Like A Knight" (RLAK) program offers Therapeutic Horsemanship to people with disabilities in Scotland County and the surrounding areas. 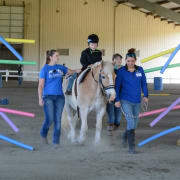 Therapeutic Horsemanship is an equine-assisted activity focused on contributing positively to the cognitive, physical, emotional and social well-being of individuals with disabilities. RLAK has offered Therapeutic Horsemanship to the Scotland County school system as a service to the community since 1996. Community members who choose to become volunteers for RLAK learn hands-on skills with the horses and their riders. While benefiting the community at large, RLAK provides SAU students with an opportunity to get a real teaching experience as they pursue their journey toward becoming certified Therapeutic Riding Instructors with the Professional Association of Therapeutic Horsemanship International (PATH International). All RLAK activities are supervised by an Advanced PATH instructor and industry standards and best practices are followed as RLAK is also a Premier Accredited Center with PATH International. Would you recommend St. Andrews University's Ride Like A Knight Therapeutic Riding Program?